…and today I have a wicked art hangover! This past weekend, I took 5 mixed media workshops from Kelly Kilmer, who was the visiting artist at The Artists’ Nook this month. There are no words to describe how much I love Kelly’s classes and how much I get out of her workshops. Every time I take a Kelly class, I am able to play, experiment and I always get new ideas, either from her, or from expanding on something she or another student said. Seeing Kelly and learning from her. She is so creative, free and amazingly supportive. Learning more about layering and color mixing and composition. Realizing that some of the crazy stuff I do in my journals isn’t as crazy as I thought! Seeing my old pals, like Susan and Marcy and Karen and Terry, who I haven’t seen in a long time. I really admire the talent of these ladies! Meeting new people! Yes, I’m talking about you, you Ladies From Parker! Three full days of making art and playing. Heaven. Last night, I was so amped up, I made 14 of the little paper journals while we watched tv. I love them. I think my favorite book was the Reclaimed book. I love the idea of taking old books, gutting them, and making new pages for them. Clicking on any of the photos below should take you to my Flickr set of photos from this weekend. I should have taken more of the process, but I was too absorbed to even think of that. So, I’ve had this item on my To Do List forEVER. The item? Update my blog with the work I’ve been doing. Of course, first I had to finish the work, then I had to photograph it, then I had to upload it, then I had to write something. Well, you can see how all of this could stymie me. This year, except for the part where Tim and I bought our new house, has been awful. I learned a few things that were good, but overall, I tell you, I could have skipped the whole damn thing! As a result of the little bit of retrospection I’ve done on 2007, I’m more looking forward to 2008. My big goal? No more PROCRASTINATION. The procrastination (brought on by fear, for the most part) is the big thing that’s keeping me on this terrible treadmill. I’m not going anywhere! Well, that’s all over now. Really. Here are some things I’ve been working on. You can click on the images to see the larger versions on my Flickr account. Tomorrow, I intend to post about what’s up next. 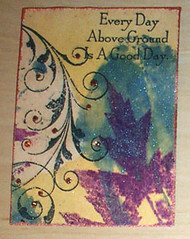 A holiday-ish altered assemblage screen I did for the Altered Art Divas 12 Days of Christmas Swap I joined. All of the gifts I received are also on Flickr. The screen is available in two sizes at SunSpirit Studio. 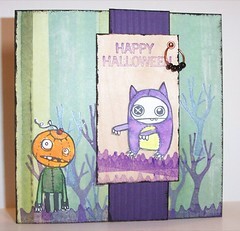 My favorite Halloween card ever. 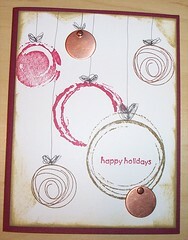 Made with (wait for it…) SunSpirit Studio rubber stamps. This is the finished plaster house that I began in Stephanie Lee’s class a couple of months ago. I’m really pleased with it! There are a few other items I started in that class, and you can see them in their varying states of unfinishedness on Flickr. An altered composition book I covered for my sister’s au pair this Christmas. The inside covers are done, too, and I added ribbons for a closure. 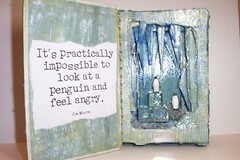 An altered book assemblage made in a Michael deMeng class. I don’t think he really dug my penguins and non-deMeng colors, but I do think he was amused! 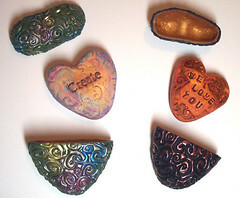 These polymer clay encased hearts are the result of a class with Colorado artist Tejae Floyd. I am so entranced by these, but my patience level for working with clay is pretty low. You can see a photo of them all closed up here. 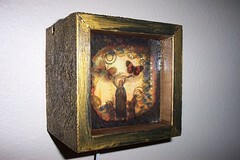 A lightbox with layers of glass and transparency, created in the Michael deMeng class “Weird Wonderful Windows”. 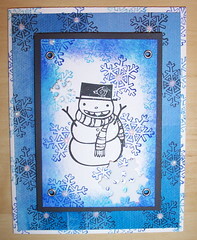 A fun snowman card I made with SunSpirit Studio rubber stamps. I made a bunch of background paper and created a series of ATCs with it. Here’s one of them, used for an ATC lottery. If I had the energy, this would have been our Christmas card this year. I will probably do a variation on it for next year, because I love it. Stamps from Paper Bag Studios. I didn’t do as much stuff this weekend, art-wise, as I would have liked, but isn’t that the story of my life! Saturday, I met up with the Mile High Book Arts people, and we all worked on our pages for a really cool book we’re doing called “Melange Book.” It’s based off a bunch of inspirations, including a class some of us took last year with Bev Brazelton. We are gutting an old Encyclopedia to use as a cover and we’re making crazy cool pages out of chipboard, fabric, copper mesh, whatever. I only got one page finished, but I painted a lot of pages. I decided to go with a blue theme, because my decision making skills have been lacking as of late. The book will eventually be a book of inspiration for myself…when I have those low points, the book will be there to remind me of how far I’ve come, rather than how far I still have to go. Then yesterday, we had Art Party at Christine’s store and she showed us how to use Precious Metal Clay. PMC is a clay that’s made of fine silver, with binders that give it the clay form. You mold your charm, pendant, whatever, and then fire the clay. The binders burn off, leaving you with the silver. 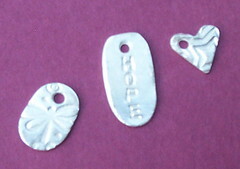 I made three tiny charms. I’m going to make a necklace with them. I have a number of other projects rattling around in my brain: Body of Art Challenge for the Artists’ Nook, my trades for Art Unraveled, new work to place in the Artists’ Nook and at SunSpirit Studio in AZ. I think those are the biggies that I have to do before I head to Phoenix. It feels good to write them down. It makes me a little less anxious. I think tonight I’ll be doing some journaling. It may be all I have energy for! 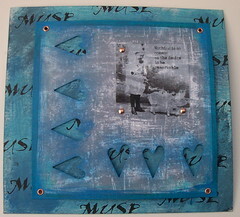 Posted on July 2, 2007 Categories altered books, collage, workshops2 Comments on art from this weekend.